THUS, if we stated: “Bob Evans mustache & specs cabinet card Leonard: Swampoodle MA 1889” according to the Headline Listing Format, this would translate to mean that the photo shown is a photo of Bob Evans with mustache & spectacles in cabinet photo card format taken by Leonard [photographic studio] in Swampoodle MA in 1889. NOTE: Every single piece of information we have on this item is contained in this description, including the name of the person, if known; if a name for the person is given, it is written on the front or back of the picture in ink or pencil, either originally at the time of the photo, or, in some cases, by us when we remove a photograph from an album in which identifications are written on the pages, not on the photos themselves. We also do not invent names for these people, so please do not ask “How do you know this is J*** S***?” We would not say who it is unless we did know based on the information on the picture itself. And finally, we cannot, due to staff and time limitations, scan picture backs if they are not shown. What we judge to be important backs are scanned and shown in the auction description. Introduced in the 1860s, cabinet cards superseded the carte de visite. The format was common until about 1900. Early cabinet cards typically used albumen prints, although a variety of other processes were used for later cards. The mount is usually about 4 ¼ x 6 ½”. 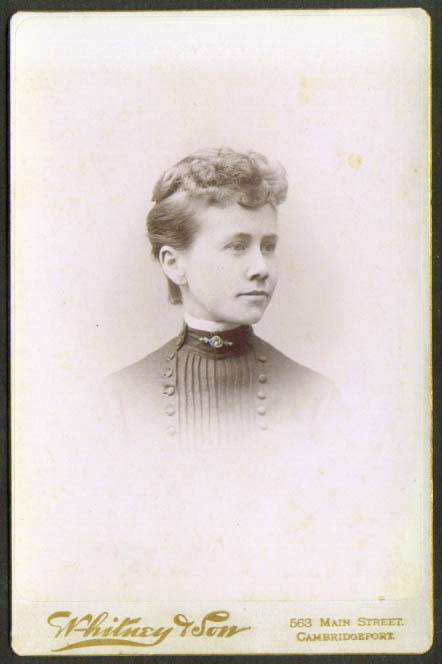 The photograph is usually smaller than the card, leaving approximately a half inch at the bottom, where the name of the photographer or studio was printed. Often, the photographer will have the back printed simply with his name, address and location or in quite elaborate fashion with organic designs and rustic forms or an image of the building where the studio was located. 1900's - the motor car.